The beautiful Eternity ring from the Thomas Sabo Sterling Silver collection is a romantic gift for someone special. 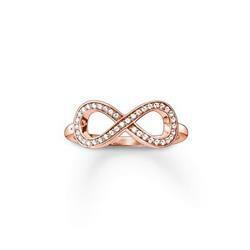 This stunning design is twisted into the eternity symbol and beautifully plated in 18ct Rose Gold. Adorned in sparkling Cubic Zirconia stones, this fabulous design is a beautiful way to show everlasting love.